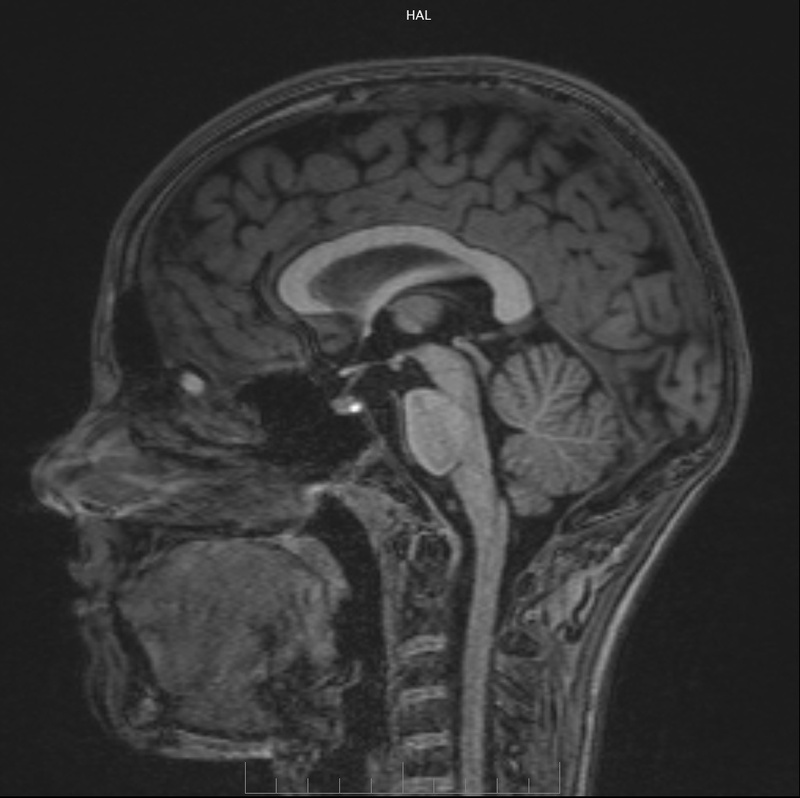 We now have some cool images of my son’s brain thanks to his participation in the study on reading and reading difficulties by the Gabrieli Lab at MIT in Cambridge, Massachusetts. Part of the study involves an fMRI (functional magnetic resonance imaging) of the brain to understand brain basis of reading and language. I cannot say that I even begin to understand this. Even the few questions I did ask about the research made me realize the complexity of the subject and the knowledge of neuroscience of the technicians conducting the testing. Yet, it felt good to be participating in some research that will lead to a better understanding of dyslexia. The MIT campus in Cambridge is always fascinating to visit. From our designated parking spot, we made our way to the McGovern Institute for Brain Research that took us alongside a railroad track. People sat in the building above us as we walked through an underpass noisy with the sound of air being sucked through large vents and the humming of air-conditioners. Even on a Sunday afternoon it seemed that the MRI scanner was in constant use as one appointment ended and our appointment began. For nearly two hours, my son laid head first in the scanner. The lower half of his body protruded out of the scanner. The only thing I could clearly see was the bottom of his sock-clad feet. As a mother, I was not impressed with the state of the bottom of his socks, but I was impressed by his cooperation and perseverance to remain still during the specific tasks he was given to complete and to enable good quality images of his brain to be obtained. At $30 an hour, he had some incentive. 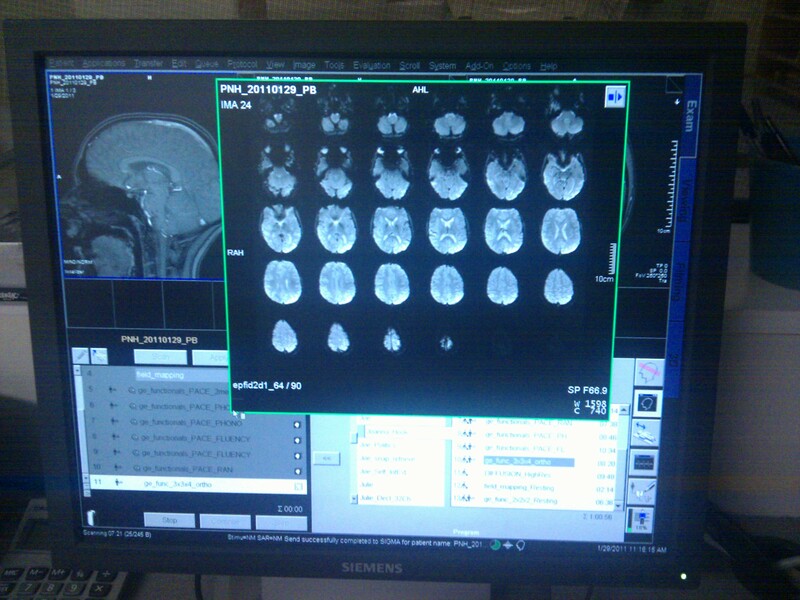 We were informed that my son’s brain is one of the last five brains to be scanned in this study. The study, with 500 children and adults taking part, which began three years ago, is nearing its end. This is good news for us as we can expect to see a report from the study in six months time, rather than waiting over three years like those who participated earlier in the study. The only concern, my son pointed out, was that his twin brother would not be taking part in the fMRI part of the study and would therefore miss out on the remuneration. It seems we equate being able to read with intelligence. Maryanne Wolf raised this notion in the recent HBO documentary Journey Into Dyslexia. This does not make sense. What I could understand more is if we equated being able to read with being educated. But, even that’s not true. HBO’s synopsis of Journey into Dyslexia quotes a recent poll that indicates eighty percent of Americans equate dyslexia with mental retardation. Mental retardation is a very loaded term. On one hand, the term implies a lack of intellectual ability to learn or the lack of skills for daily living. On the other hand, the term is used to make fun of other people. The term should not be used, especially to label a person. Perhaps it was used in this instance deliberately, because it is charged with meaning and it does get a reaction. Instead, adults and children need to be fairly and honestly educated about dyslexia. On the surface, someone who is dyslexic may look like they do not have intellectual ability. Cognitive testing reveals that, with dyslexia, the ability to read has nothing to do with intelligence. I can vouch for this because testing, using the Wechsler Intelligence Scale for Children (WISC), has shown that my dyslexic children are intelligent and have well above average IQs. So, let’s get it out there – dyslexic people are intelligent. Brain research has found, and the HBO documentary Journey Into Dyslexic testified to this, that reading in people with dyslexia activates areas of the brain that are different from the area of the brain usually activated by reading in people without dyslexia. We should equate knowledge, learning more and not making assumptions about dyslexia with intelligence and being educated. The dyslexic student doesn’t fit into the education system. It’s like trying to climb into a box that is too small. As I watched HBO’s Journey into Dyslexia last night, the documentary emphasized the struggle for the dyslexic person in the education system. The education system was described as having chosen a narrow band of learning in life into which the dyslexic student is expected to enter, and the main way through which he or she can achieve success, or failure. In the documentary, each dyslexic person interviewed had difficulty fitting into the education system. Most of them had emotional scars from this experience. It was heart breaking to hear their stories. The documentary brought to mind my frustration, as a parent of two dyslexic children, with the education system. Often I struggle with knowing how best my children can survive their time within education and emerge from it as successful and unscarred. My underlying assumption, sadly, is that they are never going to be truly successful. I try to help make the system work for them, but success within it relies too heavily on being able to read and write. I’ve found that most dyslexic students are offered slower-paced classes, because they don’t read and write with the same fluidity as other students. Slower-paced classes mean that less content is covered. Dyslexic students do not have a problem with understanding content. The problem is being able to access the content through reading and explain their understanding through writing. Slower-paced classes are not an answer to the problem. Slower-paced classes are an insult to their intelligence. Dyslexic students are offered reduced curriculum. They are provided with textbooks that are easier to read, but that are also below grade level. Consequently, the content is less challenging. This also is an insult to their intelligence. Dyslexic students are offered reading, and speech and language services in place of other classes. Often in middle and high school they have to miss out on particular subjects or electives in order to have these services. The classes from which they are excluded are likely to be subjects in which they could excel, given the right teaching. The lack of variety of subjects is an insult to their intelligence. Instead, they have to spend more time on reading and writing in which they are never going to be able to succeed. All of this is frustrating and it is not an education. So, what can the dyslexic student do to overcome this? They have to be encouraged to struggle through the current education system or they succeed by going around the education system, and excelling outside of the traditional academic environment. Having said all this, some credit must be given. Understanding of dyslexia within the education system has improved. At one point, and this was apparent in the documentary but I also know this from experience, dyslexic students were not diagnosed, and instead were told to give up at school, to leave, or seated at the back of the class. There was little hope for them within the education system. Today, the understanding is better. Dyslexia is diagnosed within the education system and help is given with reading and writing. However, there is still an awful long way to go in changing the education system to allow people with dyslexia to be successful. My feeling is that those with dyslexia are the ones who are able to identify areas of change needed within the education system because they are the ones who can think outside it. Hearing words of encouragement whether you’re dyslexic, or the parent of a child with dyslexia can make a huge difference to your outlook on life. It can turnaround your life and make the future much brighter. From the first day of attending The Carroll School that specializes in teaching children with dyslexia my daughter she came home a different child. They understood she needed to hear that children with dyslexia are smart and this is what they told her. This encouragement was the beginning of my daughter becoming confident in herself and her abilities, and being hopeful and optimistic about her future. The experience I had when my son, who also has dyslexia, required speech services, was completely different. His difficulties with speaking were constantly reinforced. After every session the speech therapist would tell me what he could not do and say. I thought he would never be able to speak! So, I decided to change to a different service provider and speech therapist. On our first meeting with the new speech therapist I tentatively asked if he would ever be able to speak clearly. “Of course he will,” she told me in a casual and blasé way, walking off holding my son’s hand, seemingly totally unaware of my angst. It was obviously of no question or concern to her that my son’s speech would be a continuing problem. Her encouragement changed my attitude completely. Our twice-weekly speech sessions were no longer filled with dread. I could see a brighter future coming. I became hopeful and optimistic. She was right, too. My son is now an articulate speaker.